Background: The cytochrome P450 (CYP) enzymes are membrane-bound hemoproteins that play a pivotal role in the detoxification of xenobiotics, cellular metabolism and homeostasis. Induction or inhibition of CYP enzymes is a major mechanism that underlies drug-drug interactions. CYP enzymes can be transcriptionally activated by various xenobiotics and endogenous substrates through receptor-dependent mechanisms. CYP enzyme inhibition is a principal mechanism for metabolism- based drug-drug interactions. Many chemotherapeutic drugs can cause drug interactions due to their ability to either inhibit or induce the CYP enzyme system. Predictions based on in silico analyses followed by validation have identified several microRNAs that regulate CYPs. Genetic polymorphisms and epigenetic changes in CYP genes may be responsible for inter-individual and interethnic variations in disease susceptibility and the therapeutic efficacy of drugs. Objective: The present review is a comprehensive compilation of cytochrome P450 structure, function, pharmacogenetics, pharmacoepigenetics and clinical significance. Conclusion: Knowledge about the substrates, inducers, and inhibitors of CYP isoforms, as well as the polymorphisms of CYP enzymes may be used as an aid by clinicians to determine therapeutic strategy, and treatment doses for drugs that are metabolized by CYP gene products. Keywords: Adverse drug reactions (ADRs), cytochrome P450, drug interactions, genetic polymorphisms, microRNA, moonlighting proteins, xenobiotics. Keywords:Adverse drug reactions (ADRs), cytochrome P450, drug interactions, genetic polymorphisms, microRNA, moonlighting proteins, xenobiotics. Abstract:Background: The cytochrome P450 (CYP) enzymes are membrane-bound hemoproteins that play a pivotal role in the detoxification of xenobiotics, cellular metabolism and homeostasis. Induction or inhibition of CYP enzymes is a major mechanism that underlies drug-drug interactions. CYP enzymes can be transcriptionally activated by various xenobiotics and endogenous substrates through receptor-dependent mechanisms. 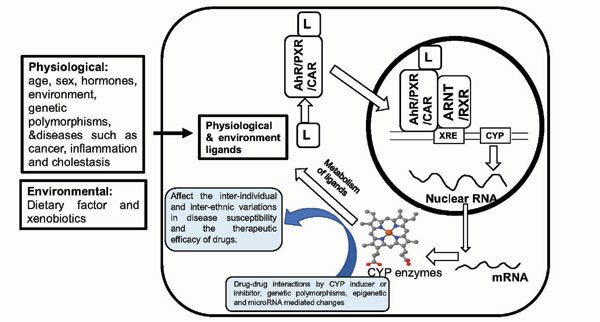 CYP enzyme inhibition is a principal mechanism for metabolism- based drug-drug interactions. Many chemotherapeutic drugs can cause drug interactions due to their ability to either inhibit or induce the CYP enzyme system. Predictions based on in silico analyses followed by validation have identified several microRNAs that regulate CYPs. Genetic polymorphisms and epigenetic changes in CYP genes may be responsible for inter-individual and interethnic variations in disease susceptibility and the therapeutic efficacy of drugs.